This new Fun karaoke Songs page was inspired after I'd been scrolling through my Facebook page and came across a post shared by a good friend— and thought findakaraoke fans might enjoy it too! I know I did! After a quick bit of online research I found that the Top TEN songs TO NOT SING while incarcerated in prison looks like this—*Seriously what’s with all the Backstreet Boys songs!!! 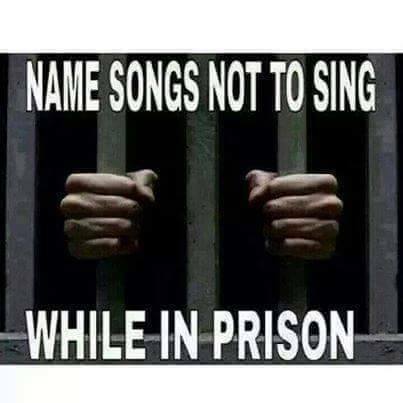 Findakaraoke's Fun Karaoke Songs To Avoid If YOU are in Jail! Taken from my Facebook page in NO specific order!